When the sun rises, we’re on our way towards the coast. Ruins along the trail look definitely creepier in the dark than during the day. We soon saw Playa de Chinguarine which is a good spot for a bivi too. When we were there the wind was very strong though and the waves huge and noisy so we were trying to avoid the beaches and rather slept higher up. 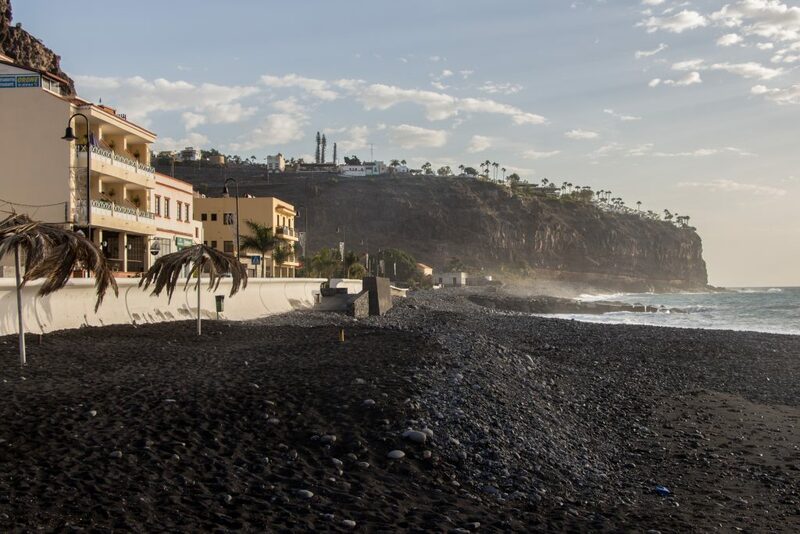 We soon reached Playa de Santiago, a touristic town on the coastline. They have an awesome thing on the beach: shower! Its location is a bit unfortunate as it’s literally a dozen metres away from the city square. I have to admit it might look a bit weird when two shabby hikers are taking a shower in the middle of town while people are having their morning coffees but we didn’t have a choice. It was the only one shower there and a red flag had been signalling that the ocean was too dangerous to swim in for the second day in a row. Another section to Alajeró is quite tricky and as I discovered later, many walkers skip it. It’s a challenging, 800m plus ascent without any of the spectacular views that you’re used to from the previous sections. I found it just great though. It’s very relaxing and beautiful too in its details when the red dry soil is slowly turning into green valleys full of palm trees. The dry section also gives you a very good base for things which are about to come: Barranco Charco and Barranco de la Negra. They’re absolutely astonishing, roughly shaped wild canyons, the most incredible ones I’ve seen. 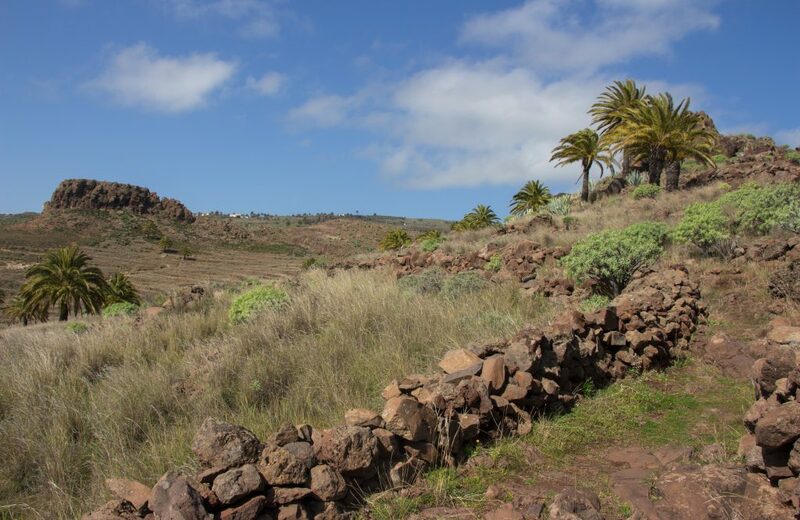 The valley bottoms are covered by palm trees and random terraces covered by green grass glazing all the way up to the trail. 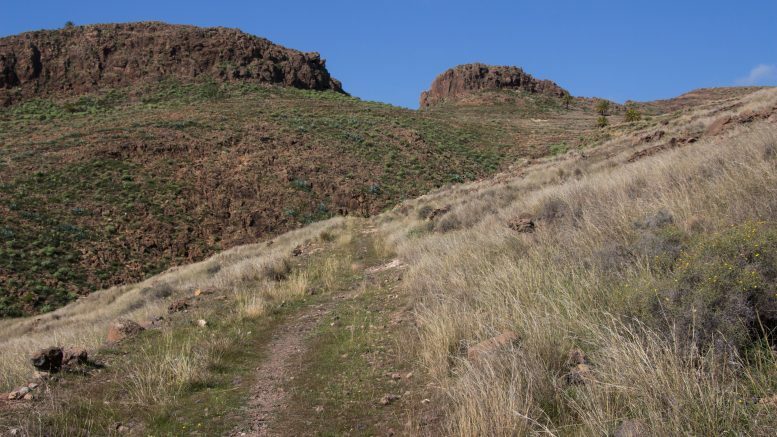 The trail is tiny and cut through the middle of the 200m tall slopes. 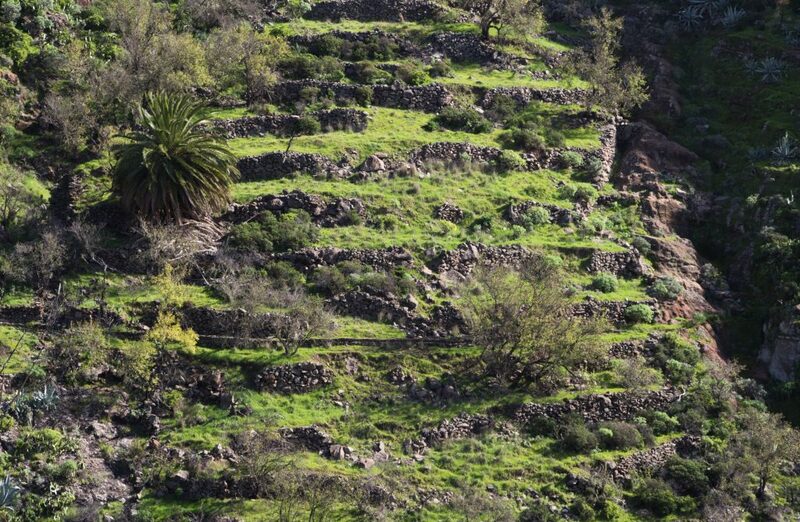 At the first sight they look vertical but after a while you can spot short terraces here and there in unbelievably remote places. It’s hard to imagine that someone could live there or even plant something! 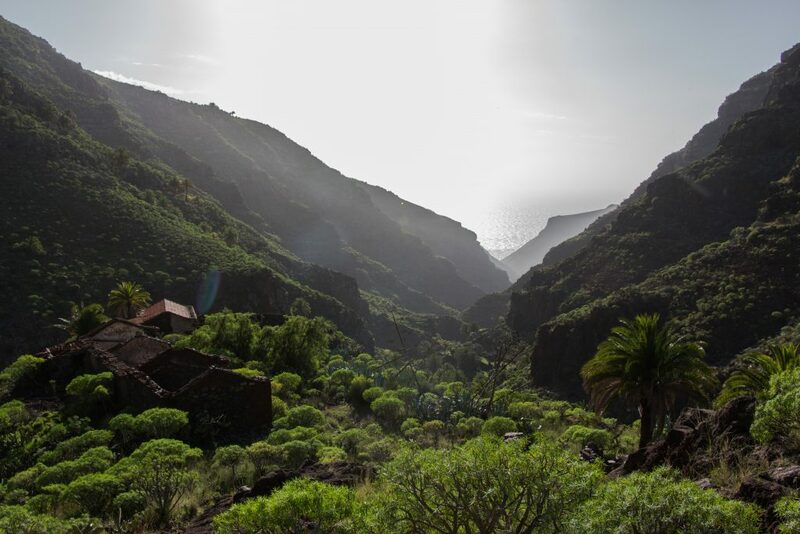 When we came to a viewpoint of the whole valley and even the ocean with a few grassy terraces, we agreed we couldn’t go any further and that we needed some time to absorb La Gomera’s magic. We pitched a tent and when we were about to go sleep, another unbelievable thing happened: we heard frogs singing. Frogs? On the top of a dry barranco? Not possible. I went to check it out anyway and believe it or not, there was a small cave with water dripping into a small pond and a bunch of frogs staring at me with what’s-up-bro look. Oh, more of the local magic! 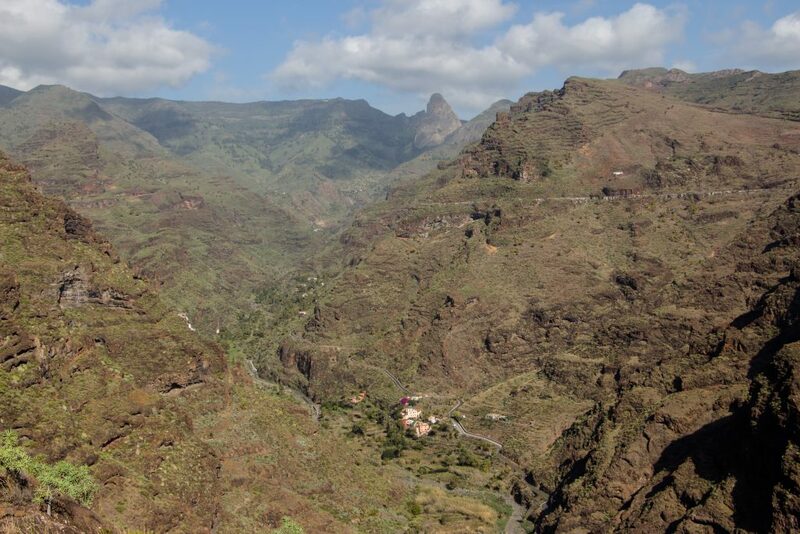 Be the first to comment on "Day 2 of GR 132: Contreras – Barranco de la Negra"